Developer: Psikyo & Zerodiv Inc.
Quick! Someone tell Nintendo, Mario has ditched Tennis and has instead opted for a shoot ‘em up! Just messing, we are happily reviewing Samurai Aces though! 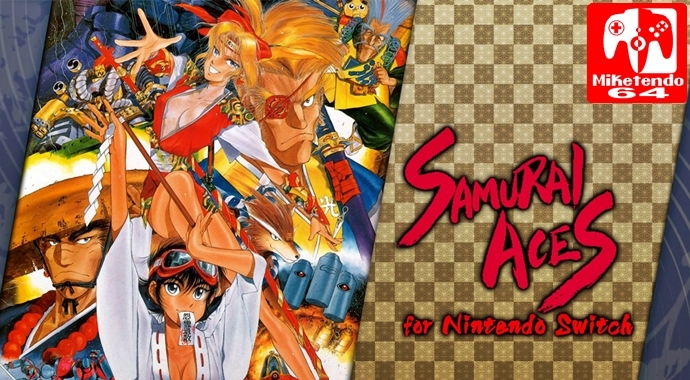 As a Psikyo arcade shooter, Samurai Aces performs very similar to that of their other titles on Nintendo Switch, but just because something is the same as something else, it’s not necessarily a bad thing since Samurai Aces did originally come before the others and helped set the standard for what Psikyo’s shooter games could be like and it is actually rather enjoyable. Graphically, there’s not much of a difference to all the other arcade games Psikyo have brought to the Switch table, as Samurai Aces isn’t all that impressive on the eye, but it’s retro, it’s colourful and there’s just enough detail so that you can easily distinguish every ship, blast, coins and obtainable items such as additional Bombs and Power-ups, so it’s your typical arcade looking title and there’s nothing wrong with that. Talking of arcade, as another Psikyo shooter on Switch, Samurai Aces is a vertically-scrolling shmup where players are tasked with getting as high a score as they possibly can with the given number of lives afforded to them, force to battle waves of enemies, just to reach the boss at the end of each stage and take them out. Beat them all and you beat the game, but shooting won’t be enough, as you’ll also need to dodge, collect whatever powers you can to destroy anyone in your path and when things get really hectic, use the X button to release a bomb that will clear almost everything it hits. As an arcade shooter, which has 7 different difficulty modes, no matter how much skill you may have, you will die and if you run out of lives and continues (continuing doesn’t cause you to lose any of your all-important points,) you will be met with a game other, unless you see fit to change that. Much like the other Zerodiv ports, in the game’s settings, as well as a manual, you will find game settings that can be used to change the number of continues you have to Unlimited and give each run more lives, so as to better your chances of emerging victorious. You could argue this handicap can make Samurai Aces for too easy for some, but for the players looking to make it all the more harder for themselves, it is something you can arrange and if you refuse to play along with someone else, then at least do yourself a favour and rotate the screen as Tate mode is supported and Samurai Aces actually looks all the more better for it. If you do try this though, be sure to film your epic runs, as Video Capture is supported and the awesomeness that is your talent can be shared to your peers on Facebook and Twitter, so you wouldn’t want to disappoint them now would you? When it comes to their shooting games, Psikyo clearly has a way of doing things, as most of them all follow the same format and that’s okay. Sure, you could say if you’ve played one, you’ve played them all, as its true most of them are copies of one another, but there is an audience for games like Samurai Aces and that audience is only growing ever larger the more willing gamers bite the bullet and make the leap to Switch. So, the only decision you need to make is are you part of that audience, or aren’t you? However you answer though, as long as you go into Samurai Aces expecting your typical shoot ‘em up arcade experience, then you’ll be a-okay! *Review Key Provided by Zerodiv Inc.